We Now Buy Your Old or Broken iPhone at iPhonefixed! It happens every year. The newest iPhone comes out and we get excited about the new features. When it’s announced we think, “maybe I’ll get it at some point”. But then we start to see the new phones in person, we see their awesome features in action, and we start to look at our current iPhones with a tinge of disappointment in our eyes. 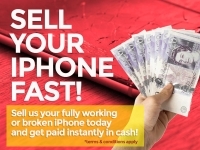 This is just one of the many reasons where being able to your iPhone fast with iPhonefixed in Cardiff comes into play!